Janusz Ludwig (1936-2016) was born in Lodz, Poland. At the outbreak of World War II, his family managed to escape to the Soviet Union. Unfortunately, they were soon mired in Siberia, where Ludwig’s parents disappeared. Thankfully, Ludwig and his sister made it to Israel, together with a group of other Polish children (many of whom were orphans) by way of Iran. They settled in Tel-Aviv, and were raised by their cousin. In Israel, Ludwig adopted a new name: Avigdor Ben-Gal. Though he initially aspired to be a physician, Ben-Gal enjoyed his military service with the IDF, and decided to be a career military man. He saw his first action in Egypt during the 1956 Suez Crisis. Just over a decade later, he was an operations chief during the Six-Day Way. By 1973, Ben-Gal was commander of the 7th Armored Brigade. He sensed that a war would soon break out, but was ridiculed by most others within the political and military sphere. Nonetheless, he began preparing his own brigade for war. When the Yom Kippur War did indeed break out, Ben-Gal’s brigade was the only one ready for combat. They were able to miraculously defeat the Syrians in the Golan Heights despite being heavily outnumbered (700 Syrian tanks vs. 175 Israeli tanks). Ben-Gal’s skill and heroics turned back the Syrian invasion after just 3 days of combat. He then led a brave counter-offensive that brought the IDF within 20 miles of Damascus just 4 days later. At the war’s conclusion, Ben-Gal was credited with having “saved the State of Israel” by defense minister Moshe Dayan. 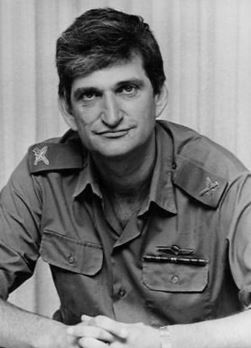 In 1976, Ben-Gal helped to plan the rescue operation of Israeli hostages in Entebbe. A year later, he was put in charge of Israel’s Northern Command. After retiring from the military, Ben-Gal served on the board of Israel Aerospace Industries, the state-owned aviation manufacturer (and one of Israel’s largest employers). He was also on the board of Tahal – an engineering and infrastructure company that is an important defense contractor – as well as the NSO Group, an Israeli tech start-up focusing on surveillance and security. Sadly, Ben-Gal passed away last Saturday. I will always stand with Israel. I can’t tolerate people who criticize Israel without walking in their shoes. I hate the lies they spread and their lack of knowledge. I’m proud to stand up for the Israelis. This entry was posted in Extraordinary Individuals, Law, Politics & Military and tagged Damascus, Entebbe, Golan Heights, IDF, Iran, Israel, Israelis, Lodz, Military, Polish Jews, Siberia, Six-Day War, Soviet Union, Suez Canal, Suez Crisis, Syria, Tel Aviv, World War II, Yom Kippur War on February 18, 2016 by Jew of the Week.